If you hate Christmas this black and yellow Bah Humbug badge is perfect for you. 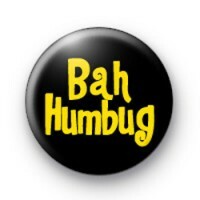 Inspired by Ebenezer Scrooge this Bah Humbug badge is perfect to tell the world how much you dislike Christmas. Also perfect to poke fun at friends & family. Standard 25mm badge hand made in our UK workshop. We have a great range of Christmas badges so be sure to check them out.